In an article, “Golda’s notebook for the developing world ‘in” The Jerusalem Report “by Bernard Dichek, we read how Golda Meir during her first visit to Africa in 1961, she the leaders in Africa told that they were neglecting the economic potential of women. In 1961, following the visit to Africa by Golda, the “Mount Carmel International Training Center” (MCTC) was established by the Minister of Foreign Affairs. Here women from developing countries were trained to fulfill leadership positions. When the U.N. in 2000 proposed to give women equal rights it was as if we heard Golda Meïr speak to MCTC on this subject, but then some 40 years earlier. In the years that followed after 1961 there was not much progress in Africa and we had to learn at MCTC, that you also need to involve men in these developments because otherwise nothing will change. Israel has never lived without the women in the struggle for its existence. They were the ones who made it possible, according to the rabbis that the Exodus could occur. This is because the men in Egypt had to do hard labor and were in fact being destroyed were it not that the women came to feed them at night and wash the mand brought clean clothes. They loved their husbands and also made love tot hem so children were born in this terrible time of hardship. This cooperatian between the men and women is known in Israel better than any nation whatsoever. In biblical times there was much freedom in Israel for women, but after the destruction of the Temple the influence of Hellenism entered Judaism and Christanity. After the modern State of Israel was being established civil law makes freedom and equal rights for men and women possible. It were the secular Zionists, men and women, who traveled ful of zeal to Palestine at the end of the 19th century. They were filled with a desire to return to Zion and to rebuild the land of Israël. They came with songs of longing and texts of the Prophets of the Bible to the Holy Land and began to cultivate the land. Often they had intellectual professions and they were not used to work the land with their hands. Golda Meir learned after her trip to Africa, that it was not normal that women were listened to. The world was not ready for her advice and saw the woman as a lesser creature that ought to be quiet, and to do what was asked. Golda herself was incredibly caring and cooking for Shabbat and for everyone she received at home. She was a strong woman who is a model for the Israel of our time. After the MCTC had learned of the situation and knew the men in Africa had to be involved in the development of their women, many African women were trained in Haifa in the MCTC programs. Currently there are programs in countries such as Ethiopia, India and Cameroon. Women work in this projects and because of this are having a livelihood for their families. In projects such as agriculture in the desert for countries like Niger, women play an important role. It was also the vision of David Ben-Gurion to make the Negev bloom. Through the efforts and developments in applied biology and agriculture this is successful and we can all enjoy the blooming desert in our time. Meanwhile, this knowledge is applied in 25 countries and these projects fall under the “International agriculural Research Institute” (ICRISAT). In Africa, the project “African Market Garden” is an irrigation project which employs around 10,000 women. They are in this region more reliable than men. These women spend their income for their families and because of this the standard of living has gone up. This project also has now started in Senegal. This project also has social consequences: The men take no longer additional women and men are now more often with their wives to work together in their backyard to grow plants for food. The technology is so simple that one does not need complicated training to advance and it gives a quick result. Families are drawn from the worst poverty. During Hanukkah we see how the Maccabees fought for the liberation of the Jewish People. 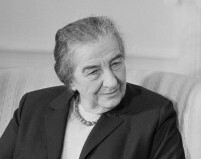 Here we see how the Lord has used Golda Meir and the Jewish People for the liberation of women and respect for them in this world and provided livelihood through them. Happy Hanukka!